Happy Hearts And Hooves Day!~ May Cadance's favour find you all. Little late, but happy New Year!~ Or does the MLP universe have its own name for it? Like how Valentine's Day is Hearts And Hooves Day? I believe I promised an explanation of what I've been up to. Well, here it is! I know; a bad start. But bear with me.~ Though I've lived in the same city for my whole life, I've moved 3 times. Times are tough. Anyway, the second move by far put me in the worst situation. My grandmother and I moved in with my aunt and one of my cousins. Things were fine at first. We got along, had fun, and were civil to each other. I can't remember the moment everything went wrong; frankly, just mentioning this is making me uncomfortable. But I can definitely recall the 3 worst experiences of living with them. My cousin was the one who did the damage. He has a short temper, violent tendancies, and access to various weapons. Not a good combination. First, there was the day our internet went out. By necessity, the modem for the internet was kept in my cousin's bedroom. See, he had a desktop computer, so he needed to connect it directly to the modem to get internet access; he couldn't use wi-fi, like the rest of us. He didn't want anybody in his bedroom without permission, no matter the reason. So, try to imagine this. You're somewhere you know you aren't supposed to be, but you don't need to be there for long. Just long enough to press a button, then leave. Then, you hear the front door open. You pray it's anybody but who you think it is. Your aunt. Your grandmother. A burglar with a gun; ANYBODY but your violent cousin. Then, you hear something else. "You're f*****!" In an instant, he's upon you, connecting with blow after blow. The beating only lasts a few seconds, and is followed by a screaming match, in which you desparately try to defend your actions, to no avail. Nobody else is home; nobody can help you. It's you and this monster. I'm thankful he didn't shoot me, or break my phone. But my stomach hurt for days afterwards, and one of his punches busted my lip open. I later found out that he knew I'd do that, and set me up. I wasn't the target of the next one, but it was still scary. I honestly forget what set this off, but this was a fight between him and my grandmother. While I didn't see the fight, I heard it, and locked my bedroom door to keep him away. He broke my grandmother's phone, threw hot noodles at her, and spit in her face. Not to mention the raging and swearing. With my phone by my side, I dialed 911. In case you were wondering why I didn't do that during the last incident, rest assured it wouldn't have helped. Police did show up, but, despite my insistance that he was in possession of drugs and a firearm, nothing was done. Likely the most scared I've ever been was when I broke my cousin's prized mortar and pestle. He kept them on a shelf in the bathroom. I had just gotten out of the shower, and grabbed my underwear, which I had put on that shelf, as well. Suddenly, I heard something shatter. No. Oh, dear sweet Celestia, NO!! The stick part - I forget what it's called - hit the tile floor and broke into 2 pieces. I thought, without exaggeration, that would be my last day alive. I wanted to run. To run and not look back until I was sure this demon couldn't find me. My grandmother, much to my horror, ordered that I tell my cousin the truth. So I did. Honestly, I'm still surprised I'm alive to type this. He screamed at me, and threatened to kick my throat in. But he never actually struck. He insisted that what I broke was irreplaceable, despite my telling him that I had found plenty more online that I was willing to buy as a replacement. We made up last Christmas, but I still have flashbacks. My grandmother and I moved to an apartment complex, where we live now. I actually don't live too far away from that house of horror. I don't dare go back. I accidentally had something shipped there, because I forgot to change my shipping address online. Whoever lives there now can keep it. I haven't forgotten everypony. I'm just working on the specifics of my character. Especially his Cutie Mark. So, I have a lot of Spotify playlists. In this particular situation, I wanted my "Best Of Arena Rock" playlist. I used up all my skips, but the last skip landed me on one of my all-time favourite songs. You Give Love A Bad Name by Bon Jovi. I have a character idea in mind, but I need a name. I have a few, though. The character will be a unicorn. Yes, I know Almond Joy is a candy bar. If copyright is an issue, substitute another nut. XD The character is supposed to study rodents. Do any of those names sound good? Play Black Ops(Clops?) 3 Multiplayer(Multipony?) online. Be sorta okay at it. Remember the Unikitty episode when she sucked at video games until Puppycorn taught her how to enter "The Zone." Fun times.~ Maybe I should try making cutie marks next. I have reason to believe that either several Pegasi are staging a rebellion, or something in the Cloudsdale Weather Factory has severely malfunctioned. Recently, we have had 2 major thunderstorms. The second of which fried both of the controllers to my PlayStallion 4, and one of the USB ports on the console itself. Several neighbours have also had sensitive equipment destroyed by these storms. If you could possibly send somepony to look into the issue(s) with the weather, you would have my gratitude. Today I learned it's almost impossible to stump Spotify. I threw several obscure/odd songs at it, and it only failed me once, when I wanted If Only Tears Could Bring You Back by Midnight Sons. Discord (Living Tombstone Mix): Yep. Lil Deuce Deuce - Beep Beep I'm A Sheep: Yep. Mark Owen - Four Minute Warning: Yep. Pennywise - This Is Only A Test: Yep. Atreyu - You Give Love A Bad Name: Eeyup! You win this round, Spotify. So, I guess Colgate's name is Minuette now? RIP, brushie memes. She's always been Minuette and it has come up on the show before ( Amending Fences) ...Her Fan Name was Colgate. I started playing the MLP Gameloft mobile game again. It changed a lot, but it's still super addicting and fun! And Fluttershy is a tutorial reward now. I continue to be surprised that Hasbro has not put out an XBox/PS4 MLP game for MLP...They even put out Game Boy games for the previous generations. Well, my Great And Powerful Trixie costume didn't work out so well, but I still got to go trick-or-treating; I had a backup costume! Was it the humble and modest Trixie? XD no. It wasn't a MLP character at all. It was Eleanor Miller from The Chipettes. ArdillaVerde93 commented on Lilia's blog entry in Stories, yay! All I need to finish my costume is a hat and a cape. I should have the hat within a week or two. The cape's gonna be a pain in the flank. The Great And Powerful Trixie Cosplay Outfit! I wasn't able to go trick-or-treating last year, but I'm not staying home this year! I decided I'm gonna dress up as The Great And Powerful Trixie! I've been working on my costume for quite a while. It's definitely not finished yet, but it's progress! The Great And Powerful Trixie doesn't use a wand, but I wanted to include her cutie mark in the costume. In the attached picture is the wand(her cutie mark. ), and some fake blue hair(I don't need to get hair dye from Hot Topic anymore; I'm gonna see if I can return the dye I already have for a refund.). I should mention that these items were purchased at the local dollar store, including the paint I used to make the wand look authentic. How does the costume look so far? I will, of course, be providing more pictures as I make more progress. My Great And Powerful Trixie costume is nearing completion! While browsing around the local dollar store, I found some very useful items; now, I'm 4 parts closer to being finished with the costume! Ah. Yeah; that makes sense. Come to think of it, one side was louder than the other ever since I got them. I was told that it was normal, because they're "stereo earbuds." 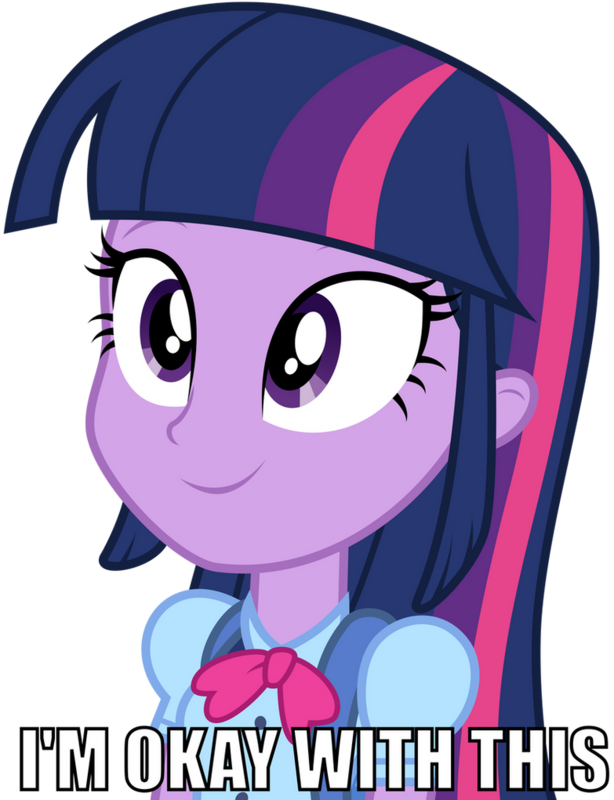 Can somepony tell me how to use the pony emoticons I see so often on this site? Well when responding to something, you should see a yellow smiley face up in our little 'Tool bar'. If you click it, it should pull up a bunch of emoticons on a line at the bottom of the box. If you click the arrow to the left it will show more faces and right arrow will take you back. Ah. Thank you very much!